I just got back from POSSE (Professors Open Source Summer Experience) hosted by Red Hat. It was quite an experience indeed. Like all other geeks I am always glued to my computer screen in worst posture possible. It gives me back pain, neck pain and after few hours of coding, I feel like I can not stand up straight any more. Greg, during the final hours of POSSE was talking about how he walks and works on his treadmill at home and then he took us down to the offices of those working at Red Hat and there is was; a treadmill/desk hybrid!!!. It was literary a treadmill with a tall (with adjustable height) desk attached in front of it. Taking Greg's advice on how it can cause neck pain because of looking down for a long time, I made few improvements and converted my own treadmill to a workstation; The notebook monitor is at the eye level, so while walking on treadmill I will look forward instead of down, I added an additional monitor for dual head (multiple screen) capability and also set two height settings for the keyboard (so my wife can use it too). It took me a day and a half and 100 Dollars to build it and since then (24 hours ago) I burned 1300 calories!! Now the only problem I have is to fight with my wife on who is going to jump on the treadmill to work(out)!!! 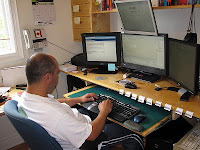 I will blog with closeup shots on keyboard stand and monitor stand, so if you like to convert your treadmill to a work station, you can get an idea of how it is done.